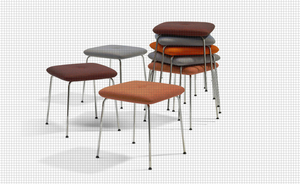 A contemporary stool is a footrest or seat normally without a back or armrests. It may take certain elements from familiar designs while expressing originality through its use of color, form or materials. For example, it might have an organically-shaped polypropylene seat supported by a stainless steel frame. These pieces are often compact. Some are folding, stackable or mounted on wheels. There are many designs for both outdoor and indoor use. Tall models are ideal for use with a high table or workbench. They are common in bars, restaurants and similar commercial settings. Lower versions are suitable for use with coffee tables, dining room tables or desks. The seat and frame may constitute a singe unit, but they are often separate components made of different materials. Popular frame materials include wood and tubular metal, while pedestal designs are often made from stainless steel. Unusual materials include ceramics and Plexiglas. Consider how the style, color and form of the stool will fit with its environment. Make sure that its height is appropriate for the function. It may need to slide beneath a table and allow for leg room. Stackable or folding models are advantageous in the case of multiple stools which will be moved or stored regularly. Determine sturdiness and care requirements. For commercial applications, scratch, stain and tear resistance may be important. Outdoor models should be weatherproof.